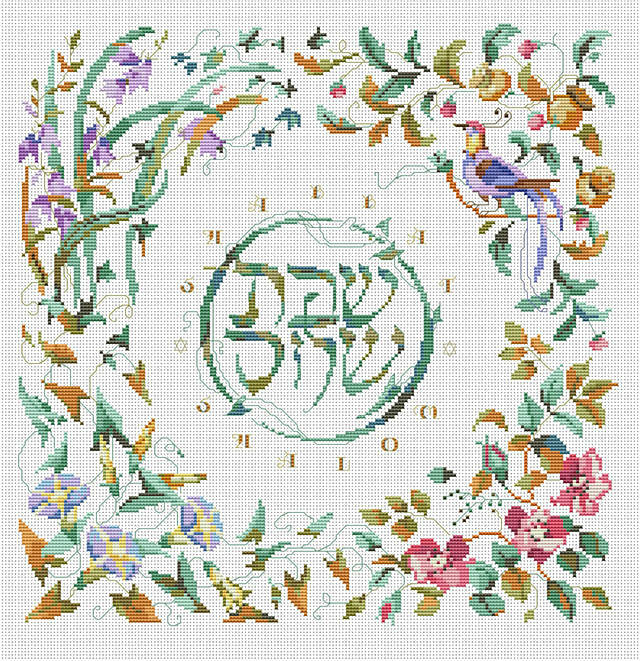 Shabbat Shalom is written in English and Hebrew calligraphy on this striking Challah cover. It is surrounded by rich symbols of the Jewish faith and will be an elegant and joyous addition to any Sabbath ceremony. Alternate sizes and possible other uses: Pillows, matzo covers, challah covers or framed as a wall hanging to be given as anniversary or wedding gifts and handed down from generation to generation. 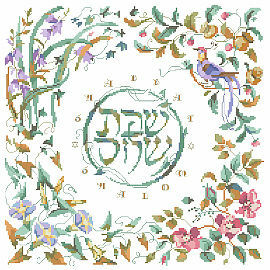 This design is the third in a series of annual Judaica designs to be released at this time each year. This Chart Pack is printed with easy-to-read symbols and chart, DMC floss color guide and general directions. This chart is offered for the stitcher who wishes to provide their own fabric and floss. No materials provided. Contents: Stitch Count 185w X 186h, Finished size on 14ct 13 1/4" X 13 1/4"